I love this ruffle tank. I also got it in the light pink color. I mean for $28 you can't go wrong. My favorite Kate Spade pumps are finally on sale! They never go on sale. I seriously wear these all of the time and for pumps they are really comfortable. I hope you have a great weekend thanks for stopping by! Love this simple but very stylish top! Love this look! You look stunning, Jade! Have a great weekend! 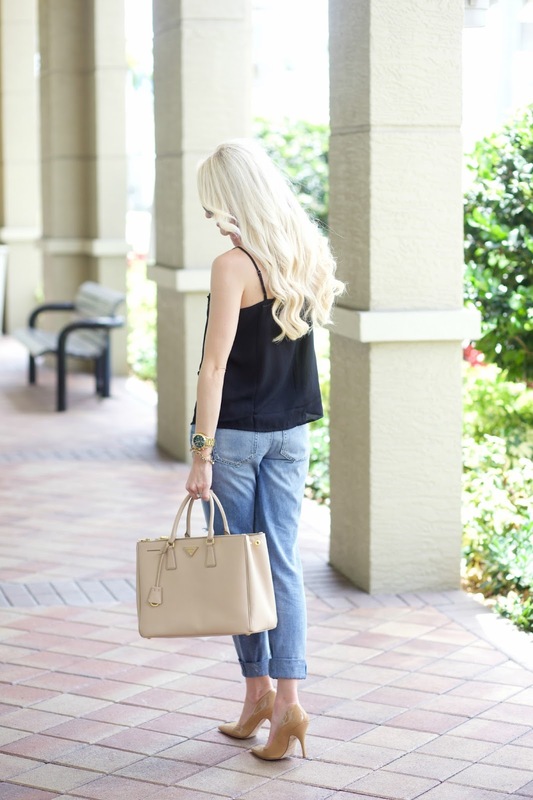 Such a great casual chic look! The ruffles add a dose of playful to the full look. I love those jeans! I'm afraid I can't pull off this style of jeans, but I gotta give it a try! Beautiful casual outfit! I like your top and bag very much! Simple, yet chic! I love it and it's so casual at the same time. Finn is a 5 month old born with a heart condition, he had open heart surgery in April and had complications, has been in the hospital ever since. I am having an instagram auction to help raise money for his medical bills. I have a lot of shops participating and just need to spread the word now. Nice denim outfit with black top! I love your style. This outfit is just perfect, as it's simple yet so stylish. I love that ruffle top. Such a great piece.